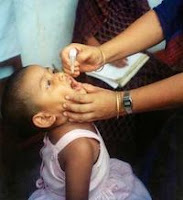 With summer coming to a close many parents are readying their children for their annual vaccinations. This year big pharma has begun their vaccine pushing a little early, and they came out swinging. Hollywood minion, Amanda Peet, took to the battle loaded with cheap shots, she is the newest spokesperson for a group called Every Child By Two, a pro-vaccine organization whose funding appears to come from the drug manufacture Wyeth. Peet showed her true vileness recently in Cookie magazine, "Frankly, I feel that parents who don't vaccinate their children are parasites." S he didn't stop there, on Good Morning America Peet urged parents to listen to the experts, doctors and scientists, not actors. "Please don't listen to me, don't listen to the actors, go to the experts." No doubt a jab at Jenny McCarthy, who wrote the book, Louder Than Words: A Mother's Journey in Healing Autism, based on her experiences as a mother of an autistic child. McCarthy along with Jim Carey have been activists, fighting big pharma head on informing people about the toxins in vaccines, asking parents to do the research before they vaccinate. But not Amanda Peet, she sits high from her perch pointing fingers, claiming to know so much more than those who opt out of vaccines because she has spoken to the experts. In fact her brother in law is a doctor, and his mentor was none other than Dr.Paul Offit, and he has told her to fear none of it! Dr. Offit is not an ordinary doctor, he is a board member of Every Child By Two, and a vaccine developer who has made his fortune pushing the filth. He is currently paid royalties from a vaccine called RotaTeq, a Merck vaccine that has recently added DEATH to its insert under the heading "What other important information should I know?" . The insert also advises that all three doses of this vaccine should be administered to your child by the time the baby is 32 weeks old! In 2004 Dr. Offit told 60 minutes, that the experts are here for us, "the people" so we should just keep quiet and trust them. "What I'm asking is that people trust their experts." Since making her crass comments Peet has issued a statement that may have been written by Al Gore, saying "Vast reductions in immunization will lead to a resurgence of deadly viruses. This is as indisputable as global warming." She's in way over her head, drowning in new world order propaganda, its almost too much to take, but her statement gets worse, insulting people who have spent their entire lives researching HIV, calling their findings baseless because they "do not get a lot of media coverage." With each paragraph her words become more and more dangerous, fear mongering that seems almost desperate, but this statement may be the foundation for her belief in vaccinations, "it's hard to believe that any corporation, medical or otherwise, has our best interests at heart. But it's irresponsible to suggest that virtually the entire medical community, and the CDC, and the American Academy of Pediatrics are behind a massive cover-up about vaccine safety. " Yes, it is hard to believe, but when you step away from the money hungry "experts" the truth is plain to see. 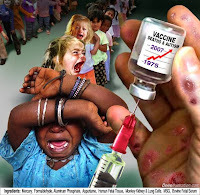 It will soon become clear; it is you being irresponsible, blindly accepting these organizations as good, and using your pulpit to fear monger, "Hopefully children do not have to die before people start to realize the cost of withholding vaccines. " "between 1994 and 2006, the number of 6 to 17-year-old children classified as having an ASD (autism spectrum disorder) in public special education programs increased from 22,664 to 211,610". The number of vaccines that we are injecting into our children has also increased; Amanda Peet, Dr. Offit and Every Child By Two, want to make sure your babies are on schedule to receive 32 vaccines before they reach the age of two. The proof is mounting, everyday there is news about vaccines and their deadly nature. Today AP is reporting from Argentina, " Argentine authorities are exploring a possible link between the deaths of 14 children and an experimental vaccine they were taking in a clinical trial run by GlaxoSmithKline." There has also been reports of questionable recruiting methods. But don't dare question the experts and their intentions.